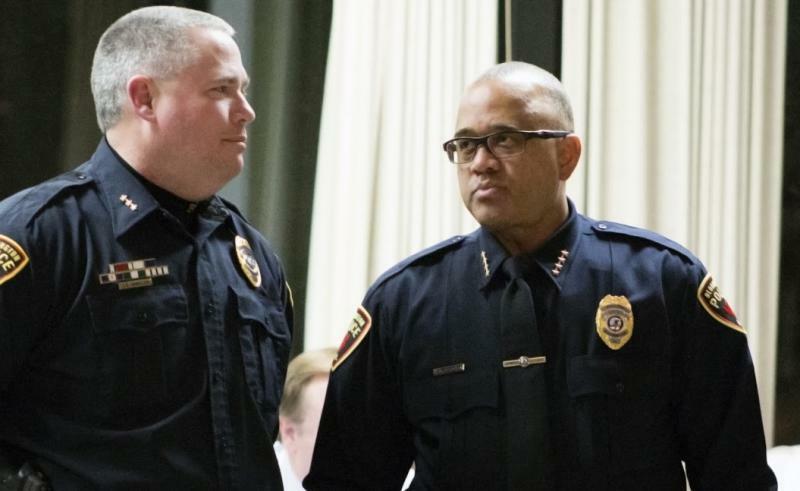 Bloomington Police Chief Brendan Heffner, right, during a city meeting. In the wake of the mass shooting in Las Vegas, Bloomington Police Chief Brendan Heffner said he supports more robust background checks "to make it harder for the wrong people to get weapons." The gun-control debate flared again earlier this month when the Vegas concert resulted in the deadliest mass shooting in American history, with 58 people killed and 546 others injured. During a recent interview on GLT's Sound Ideas, Heffner expressed support for a background check on all firearm purchases. Federal law only requires licensed gun dealers to conduct background checks, according to the Everytown for Gun Safety advocacy group. "That means that millions of guns are exchanged each year without a check—most often online or at gun shows through unlicensed 'private sellers,'" according to Everytown. The Vegas shooter reportedly had 23 guns in his hotel room from which he fired into the crowd of concertgoers. The guns were mostly fully automatic (or rigged to do so) and purchased legally in Nevada, California, Texas and Utah. Heffner acknowledged that a motivated individual will likely be able to acquire a weapon but says that policymakers can make it more challenging.